Rhode island has an area of 1,545 sq. mi. (4,001 sq. m.) with an average elevation of 200 ft. (61 m.) above sea level. The land is divided into two regions: the coastal lowlands (made up of sandy beaches, rocky cliffs, lagoons, saltwater ponds and low plains) covering more than half of Rhode Island; and the Eastern New England Uplands, a region of small valleys, rolling hills, lakes, reservoirs and ponds. 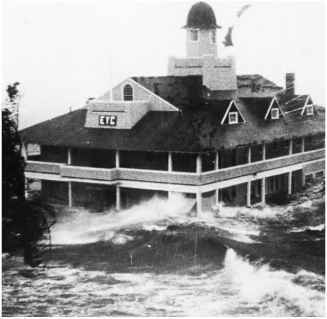 In 1969, massive storm surges from Hurricane Carol raged through the Rhode Island Yacht Club. F (23 degrees C), with an annual precipitation of 46 in (117 cm.). Temperatures are moderated by warm winds off Narragansett Bay, but extremes do occur. The highest temperature recorded in the state was 104 degrees F (40 degrees C) on August 2, 1975, and the lowest temperature recorded in the state was minus 23 degrees F (minus 31 degrees C) on January 11, 1942. Rhode Island's soil is fertile, but very rocky, and about 60 percent of Rhode Island's land is covered by forest.